The newsmagazine business isn’t what it used to be. (Though, hey, it could be worse.) But the space between the red borders of TIME magazine remains some of the most valuable real estate in the news industry. 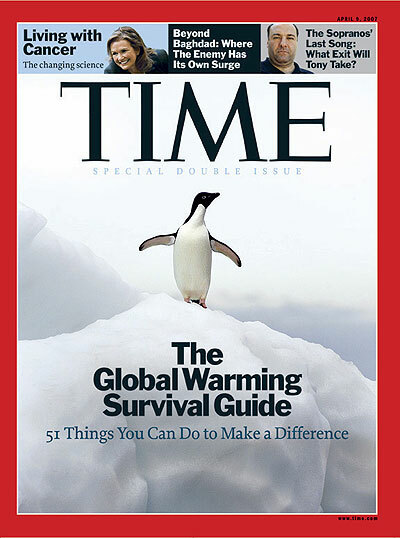 You can tell by how often doctored TIME covers show up in protest crowds, movies, TV shows and on the Web. Former TIME International editor Jim Frederick even had a copy of this fake TIME from the video game Call of Duty 3 hanging up in his office — a fact that drove me insane with jealousy. Apparently the hoax cover has been floating around the Internet for at least a few years. I’m not sure who created it, and it doesn’t seem to have gotten a whole lot of traction, even among climate-science deniers. Though kudos to whoever initially put the fake cover together. That’s some pretty good photoshopping. But the hoax does touch on an important part of climate science — and one that’s often misunderstood by skeptics. Call it the Ice Age Fallacy. Skeptics argue that back in the 1970s both popular media and some scientists were far more worried about global cooling than they were about global warming. For some reason a Newsweek article on the next ice age, published back in 1975, gets a lot of the attention, though TIME did a version of the story, as did a number of other media outlets. The rationale goes this way: the fact that scientists were once supposedly so concerned about global cooling, which didn’t come true, just shows that we shouldn’t worry about the new fears of climate change. But as John Cook points out over at Skeptical Science, global cooling was much more an invention of the media than it was a real scientific concern. A survey of peer-reviewed scientific papers published between 1965 and 1979 shows that the large majority of research at the time predicted that the earth would warm as carbon-dioxide levels rose — as indeed it has. And some of those global-cooling projections were based on the idea that aerosol levels in the atmosphere — which are a product of air pollution from sources like coal burning and which contribute to cooling by deflecting sunlight in the atmosphere — would keep rising. But thanks to environmental legislation like the Clean Air Acts, global air-pollution levels — not including greenhouse gases like carbon dioxide — peaked in the 1970s and began declining. The reality is that scientists in the 1970s were just beginning to understand how climate change and aerosol pollution might impact global temperatures. Add in the media-hype cycle — which was true then as it is now — and you have some coverage that turned out to be wrong. But thanks to the Internet, those stories stay undead, recycled by notorious climate skeptics like George Will. Pay no attention to the Photoshop. It’s the science we should heed — and the science says man-made climate change is real and very, very worrying.